J.P. Morgan's Guide to the Markets for the third quarter of 2018 is now available for your review. Inside you'll find deeper insight into the current investment environment and what the investment team at JP Morgan is keeping an eye on right now. On page 19 you'll see two charts (Real GDP & Components of GDP) that show how the economic expansion is continuing at a slow but steady pace. On page 25 you'll see a chart that displays how unemployment continues to fall, which JP Morgan believes should drive up wages. And on page 7 you'll see three charts that show how although earnings headwinds should be behind us, future growth may be muted. 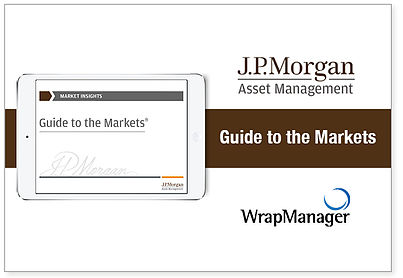 Download and review the entire 3rd Quarter 2018 Guide to the Markets from JP Morgan now, or request more information on JP Morgan's investment portfolios.